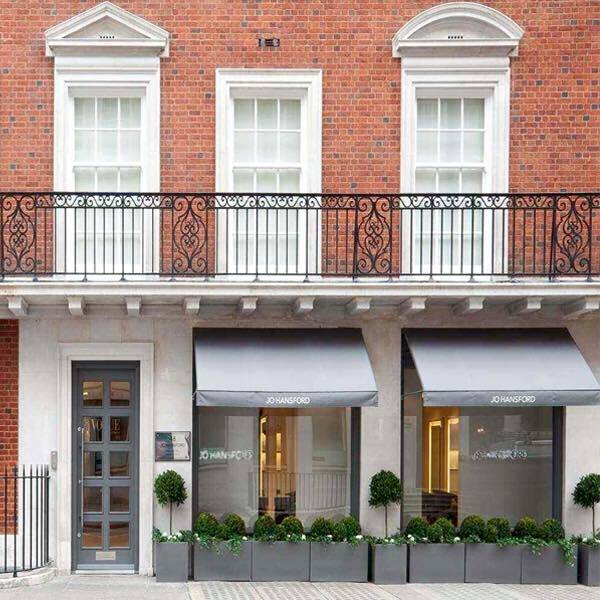 Jo Hansford Salon is situated just ten-minute walk from Bond Street Tube at the bottom of Grosvenor Square. The Salon isn’t particularly an expansive space but once I walked through the door it was a bustling hive of activity. Who knows how the 55+ members of staff actually fit in here. The clientele is a real mix of all ages and both genders.I was greeted at reception and guided to the cloakroom where I swapped my coat for a gown and was given a ticket for my return. I was booked in for a full-head of highlights but as my previous ‘build-up’ of highlights had resulted in a block colour situation, my colourist suggested a half-head mixture of reverse lights (read: lowlights) which matched my natural colour, along with a cool blonde to keep the overall blonde brightness. Jo Hansford is a salon name renowned for colour expertise so I knew I was in good hands for a colour overhaul. Fi, my colourist, first of all did a strand test to determine what the reverse lights would look like with my current colour. Twenty minutes or so later and happy with the results she set to work on applying the overall reverse lights and highlights in three sections starting at the back and working around to each side. Whist the foils on my tresses were stacking up, I ordered a fresh juice (a truly delicious and freshly squeezed orange, pink grapefruit and apple combination). A lot of high-end salons offer a food and drink menu in partnership with nearby Deli’s and bars, but the Jo Hansford menu is all prepared in-house in their designated kitchen. The menu is surprisingly extensive and offers everything from toast with butter and preserves (a reasonable £3.50), or feta cheese coriander and chilli omelettes, salads, sandwiches and nibbles. I ordered a smoked salmon and cream cheese bagel, which even by Mayfair standards (and without the name of a great local deli) a little overpriced at £9.50. Coffee, tea and water was also available – all at an additional cost. Once all foils had been applied by Fi I was put under the heater for 15 minute intervals where in-between intervals each section of foils was removed in reverse order they were applied. Once all the colour sections had developed and foils removed, my hair was washed at the basins (with nice adjustable foot rests). I was asked which choice of shampoo I would like and then given a regular conditioner, again asked if I would like it applied from mid to ends or all over. In both these instances it would have been preferable for the hairdressers to use their expertise and recommend on both counts. The head massage was excellent and I could have happily continued with that all day. Next I was taken to the ‘cutting section’ where I met with Jake. I asked for a graduated fringe cutting in and for a couple of inches’ blunt trim to make my barnet look overall more heather, thicker and in sharp condition. Now, a lot of the time when you are so specific with the vision in your mind, it doesn’t always quite turn out that way. This time however, it was an exception and Jake managed to create EXACTLY what I wanted. He finished by giving me an amazing bouncy blow dry (the kind of variety that you can never recreate yourself at home). Jake took me do the coat swap and then to reception where Fi also met me to check I was happy with my colour. Overall great results from a great name in hairdressing.